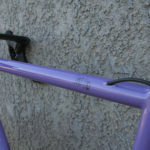 A few days ago, we had the pleasure of helping our friend Julian build up his new steel “dream” bike for the North American Handmade Bicycle Show. 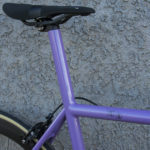 As a seasoned road racer and bonafide cycling nut, Julian commissioned a very modern frame equipped with a tapered fork, integrated seat mast, and Di2-specific frame fittings. 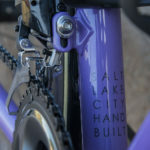 It’s safe to say that Salt Lake City frame builder Matt Nelson (SaltAir Cycles) pulled no punches on this one. 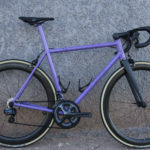 As a relatively new builder and first-time NAHBS exhibitor, Matt has shows some impressive skill, creativity and attention to detail with the execution of this unique custom frame. 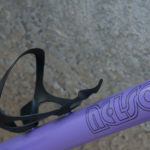 One of the major standouts is the clampless seatmast, which uses a full custom machined aluminum head piece with an internal wedge for a super clean look. 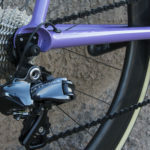 Adding to the clean look are the Di2 frame fittings, which include a custom piece on the top tube that accepts both the rear brake housing and the E-tube wire from the shifters. 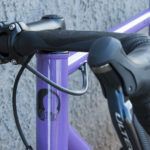 Matt opted for a straight 44mm ID headtube with an external Chris King lower headset to accommodate the Enve tapered carbon fork. 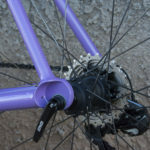 Additional features include a threaded BB for simplicity and reliability and “Breezer” style rear dropouts. 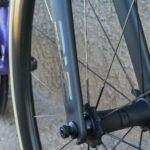 For the build, we wanted to build on Matt’s clean and simple theme by reducing the visibility of the Di2 system. 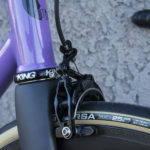 We connected the shifters with a wire routed internally through Enve’s Aero road bars, then routed the right shifter’s wire along the rear brake housing. Using a bit of heat shrink tubing effectively hides the wire while keeping it in place. 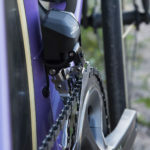 The front end of the bike has a nearly “wireless” look to it! 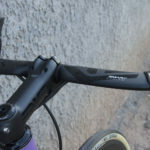 The main downside of such a setup is that the Di2 A-junction, which must be accessed for charging and adjustment, has to be hidden inside the frame, obviously an inconvenience. 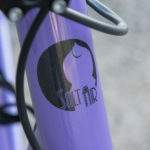 Fortunately, the design of the seat mast topper allows for quick access to the seattube where the battery, B-Junction, and A-Junction reside. It’s safe to say we’ve always been huge fans of Enve Composites, and we convinced Julian to go “all in” on premium carbon components. 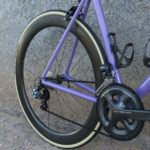 With Enve SES 4.5 rims, Enve hubs, Enve skewers, Enve Aero handlebars, an Enve stem, and Enve bottle cages, we included as much of the Enve catalog as we could. 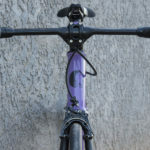 Coincidentally, even the custom seat mast was built using Enve’s saddle rail clamps. 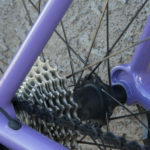 A pair of Cane Creek’s EE brakes and an Ultegra 6870 drivetrain round out this truly beautiful build. Just wanted to express my gratitude and appreciation for Richard, Fairwheel and the incredible work they executed in finishing this project – it definitely made an impression at NAHBS and went a long way in helping me bring home the 2017 NAHBS ‘Best New Builder’ trophy.